caption: © Elizaveta Porodina, portrait of Lily D. Moore, for Radical Beauty Project. I came across this project through a very complimentary review in the Guardian. The Radical Beauty Project is about “challenging opinions”, questioning perceptions about beauty. It brings together people with down’s syndrome and “40 renowned fashion and art photographers”. In creative director Daniel Vais own words, “this collection of powerful images will be turned into a collectable, coffee-table edition art book”. Regarding the models, he adds: “these models are stylised as objects of desire, talent and creativity as major fashion campaigns”. Words matter. Do you hear them? Do you know their meaning? So Daniel Vais thought the best way to “blur boundaries” regarding beauty stereotypes was to replicate the exact strategies used by the very same industry that perpetuates those differences. It’s a recipe for success: to gallop the wave of little critical awareness. I’d guess more than 100 people involved in the campaign agree with the strategy and with the idea of objectifying difference, in this situation objectifying people with down syndrome, turning “them” into “objects of desire”. Apparently, photographers also agreed to have their portraits of people with down syndrome compiled in a “coffee-table edition”. Does this celebrate difference? Does this blur boundaries? Does this accentuate the difference? If the project is all about art, why compile the portraits under the theme of “drown syndrome”? Is it a marketing strategy? There was obviously an interest in making this project – drive and financial support provided by creative director Daniel Vais, a production team, photographers and models. The press has a field day. They love the idea of celebrating difference. But who else will buy the book? And what is its price? In whose coffee-tables will it sit in? Will it fall in the houses of people who perpetuate this differential treatment regarding looks? Will it help some people feel more sympathetic towards “the other”? © Elizaveta Porodina, portrait of Lily D. Moore, for Radical Beauty Project. Sirin Kale, who reviewed the project for The Guardian, says it “isn’t some uplifting charity coffee-table tome: creative director Daniel Vais wants to make high art. 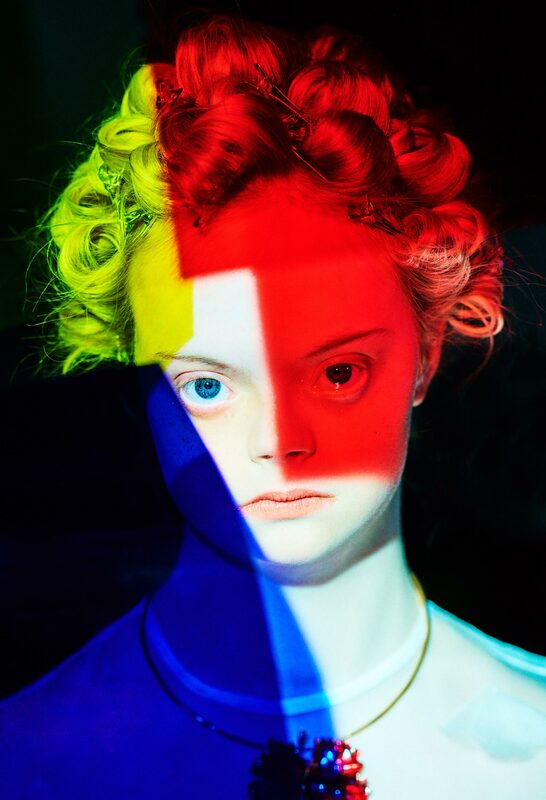 Which means the images are provocative, unsettling and, at times, difficult.” Vais has a steady position regarding the syndrome: he wants this project to help prevent the disappearance of people which down’s syndrome. What I fail to understand is if he just wants to make art, he wants to cellebrate “their difference” or if he wants to actively campaign against abortion of fetus diagnosed with trisomy 21 (something which he’s been actively speaking about)? Vais is now promoting his project, stating that his intentions were to make art and highlight the syndrome’s potential. “It’s not only about the physical book,” he says. “It’s about the beautiful community that [we’re building] from around the world.” But the creative director obviously has a ego of his own, stating “this project is creating the future of fashion”. Would be interesting to actually question what is fashion doing for human rights? What campaigns have these photographers been working on? And, again, in whose coffee-tables will it sit in? Will it serve to make some people feel they are doing charity? We all notice that society tends to refer to people as part of a bundle. Some of their characteristics rapidly turn into their identity. So, for instances, I am white and female and the models that are featured in the project are people with down syndrome. That’s not what they are. Maybe to accentuate those features is a trap: it makes their existence all about their syndrome. It’s not like it’s a side note, it needs to be addressed. I remember Stephen Fry asking people with bipolar disorder whether they’d want to live with it, if given the choice. I’ve heard people who have down syndrome respond to the exact same question and there’s no linear conclusion to take from that, as there isn’t with Fry’s documentary. Artist Sarah Gordy, one of the people who integrated the project, as model, states: “My name is Sarah Gordy, I have Down’s syndrome but that’s not all that I am. I always say that. I am an actor and a woman first, it is the same for all of us. If you have met one person with Down’s syndrome you have met one person. We are all individuals.” Then why feature in a book that addresses the syndrome (and its physical characteristics) as a stigmata? The photographs replicate the exact production strategies that go into every other fashion shot. So can I conclude that “these people”, who are different from me, want to take part in ‘beauty standards’? Or is about fairness and equal opportunities? But, again, why would someone want to be part of a discriminating industry that is supposed to be about beauty but ends up being all about social status, style and looks? A conversation with one young participant, Lily D. Moore, might suggest some answers. Is it about belonging and being recognizing be the pairs?